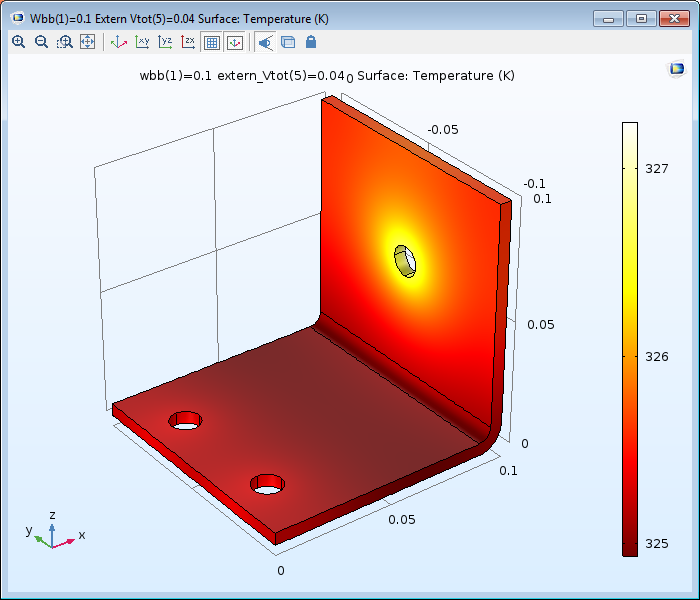 A parametric simulation of an aluminum heat sink used for the cooling of components in electronic circuits. The parameters controlling the geometric dimensions as well as the inlet air velocity are edited in an Excel spreadsheet and synchronized with COMSOL Multiphysics. The postprocessed COMSOL model can be brought into the Excel spreadsheet as a figure. The simulation capabilities of Excel® can be augmented by seamlessly integrating them with COMSOL Multiphysics®. Whether you are an engineer with years of Excel data describing your process and looking to utilize it in a COMSOL Multiphysics simulation, or you are a scientist wanting to utilize simulation to find and optimize the value of a material property, LiveLink™ for Excel® will provide you with the flexibility you need. It is only fully available in the Windows® operating system although it provides import and export capabilities when using the macOS and Linux® operating systems. LiveLink™ for Excel® allows you to take advantage of the capabilities and structured simplicity offered by Excel to extend your COMSOL Multiphysics® modeling capacity. Parameters and variables that are defined and modeled in COMSOL Multiphysics are instantly available in Microsoft® Excel® and automatically synchronized with your physics model. Moreover, LiveLink™ adds the capability to create a COMSOL® material library from data stored in a worksheet and brings it into COMSOL Multiphysics, while also enabling support for loading Excel files for parameter and variable lists in the COMSOL Desktop®. The COMSOL Multiphysics tab within Excel gives you access to a number of the features and functionalities that are available in COMSOL Multiphysics – such as opening and saving models, importing and re-defining parameters, variables, and functions, running mesh and solver routines, extracting and treating data, and presenting your results. 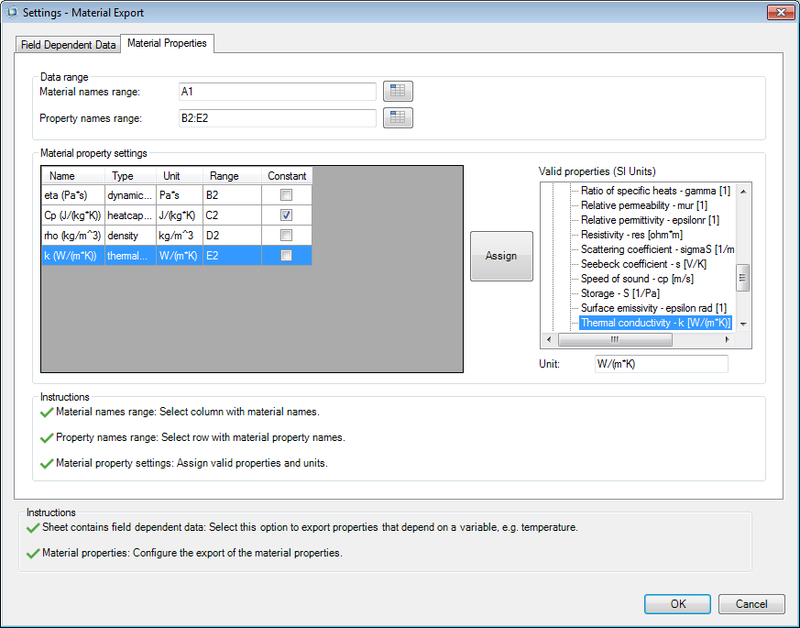 The Material Export Settings dialog box allows you to create a material library accessible by COMSOL models from material data you have stored in an Excel file. The equivalent cells in the Excel file are called from the material and property range edit fields. A COMSOL Model window is opened when running and solving models from the Excel interface to show the geometry, mesh, and postprocessing views of your model, along with the progress of the solving process. LiveLink™ for Excel® provides tools to import data directly into COMSOL Multiphysics for further use in the modeling workflow. This can include importing several of the model definitions like parameters, variables and functions, from a worksheet. Furthermore, with LiveLink™ for Excel® you can create a material library within Excel and configure the export in such a way that COMSOL Multiphysics recognizes the material properties and stores them appropriately in your Material Library. You can export results to Excel, where you can compare, optimize, and calibrate these material properties. Microsoft, Excel, and Windows are either registered trademarks or trademarks of Microsoft Corporation in the United States and/or other countries. All other trademarks are the property of their respective owners. For a list of such trademark owners, see http://www.comsol.com/tm. COMSOL AB and its subsidiaries and products are not affiliated with, endorsed by, sponsored by, or supported by these trademark owners. LiveLink™ for Excel® lets you perform and control your COMSOL Multiphysics modeling from an Excel environment. 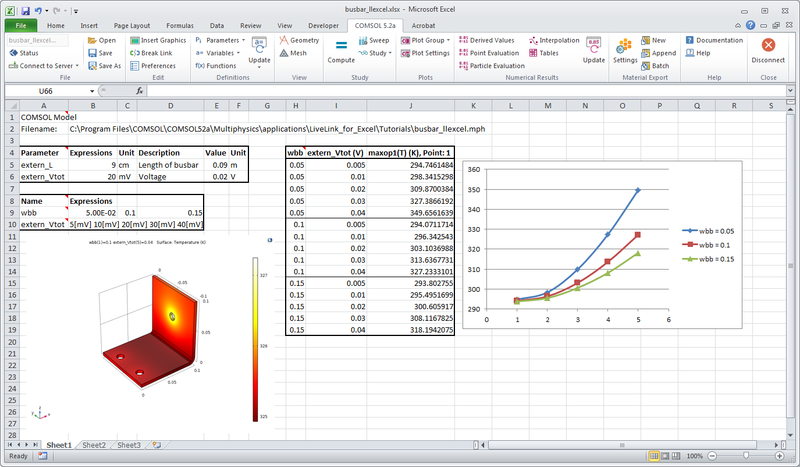 When LiveLink™ for Excel® is installed, a COMSOL Multiphysics tab is immediately made available in the Excel ribbon. With the provided COMSOL-specific icons in the Excel ribbon, you can control most of the steps in your modeling process. This includes opening and saving models; importing and re-defining parameters, variables, and functions; running mesh and solver routines; extracting and treating data; and presenting your results. Parameters are automatically synchronized with cells in the Excel worksheet, and they can be changed on-the-fly and re-synchronized, and the model can be solved again. Moreover, you can augment your COMSOL modeling with some of the tools and functionality provided by Excel. For instance, columns of data in the Excel worksheet can be used to define the point coordinates for evaluations to be performed based on the model solution. After the evaluation, extracted results will populate related Excel columns, and you can achieve curve-fitting of the extracted data by using tools from Excel. When you open a COMSOL Multiphysics® model from Excel®, a COMSOL Multiphysics® server is started, where the model file is loaded. A graphics window allows you to track the progress of the actual modeling being controlled from Excel®, as it displays the model geometry, mesh, and result plots. You do not need to have COMSOL Multiphysics® open in the background to be able to manage your modeling from Excel®. Additionally, LiveLink™ for Excel® provides seamless integration so you can insert your COMSOL Multiphysics® graphics along with your other figures and tables and produce a complete worksheet presentation.